All-in-one content management. The universal metadata description tool. It is a highly integrated SQL-database for media & content management, allowing instant access to more than 20,000 records simultaneously. Content is classified by many aspects such as type, category, genres, keywords, credits, media and etc. 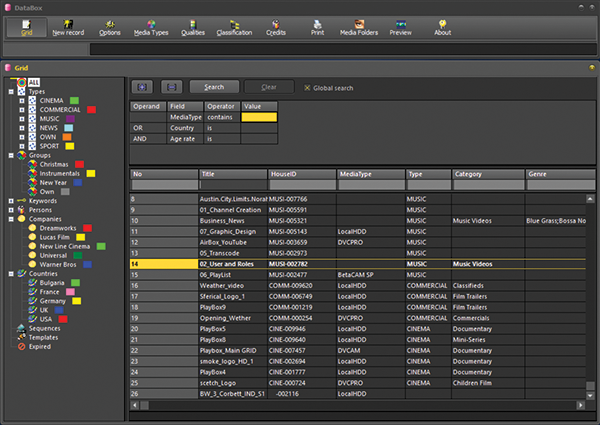 PlayBox modules obtain metadata information about media content from DataBox Neo. This enables tasks such as logo overlay, archiving/retrieving data, building/conforming on-air playlists and etc., to be simplified or completely automated. Content can be easily searched through dedicated multi-profile search, as well as by intuitive multi-criteria filtering system. Working with DataBox Neo saves lots of time when managing large amounts of programs and media archives. As soon as the content ingest by CaptureBox Neo has finished, DataBox Neo imports the media asset into the database with its relevant metadata coming from CaptureBox Neo capture list. Content coming from different sources can automatically be assigned to different metadata templates for easier database sorting. As a true SQL database, DataBox Neo clients work with a shared database content throughout the network. No special network traffic overhead is created even when multiple users work simultaneously. Content can be sorted by three main classification levels, as well as by cross-profiles such as sequences, groups, keywords and etc. The main levels are extracted from common classification schemes - type (i.e. Cinema, Music, News and etc. ), category (Show, Movie, Mini-series and etc. ), and genres (Action, Drama, Thriller and etc.). Each program may consist of many parts, recorded on separate media. Each part may consist of multiple audio/video/subtitle tracks. Each part of the interface is a data manager, dedicated to classification, credits, locations and etc. The main grid area gives a clear overview of all the content, while the classification tree is shown besides it. No special training is required for the user to master DataBox Neo.